I don’t normally write opinion pieces–I like to stick to the facts (i.e. statistics)–but in all the Jamaal Williams talk over the last 24 hours I’ve heard way too much speculation as to why he left and not nearly enough about why he should come back. First, let me say that I truly have no idea why Jamaal was “released for personal reasons.” I wish I knew… I do care and I’m very interested in the reason(s) for his departure. And those who claim otherwise are full of it. Of course we’re interested–we’re fans and we want Jamaal and BYU to succeed. That will be much harder to do without Williams carrying the pigskin. Are the “personal reasons” any of your or my business? No, probably not, and I’m glad that BYU tries to respect their players’ privacy. However, the details surrounding his departure will come out sooner or later–they have for 100% of the star athletes who have ever left BYU. I just hope that they come out when and how Jamaal wants them to. Coach Mendenhall stated yesterday that “we plan on Jamaal returning for the 2016 season.” So why should he come back? There are a ton of reasons, but I’ll keep it to five good ones: his future, his family, his coaches, his fans, and his legacy. 1. His future. This is the one that most of the media outlets have been focusing on. 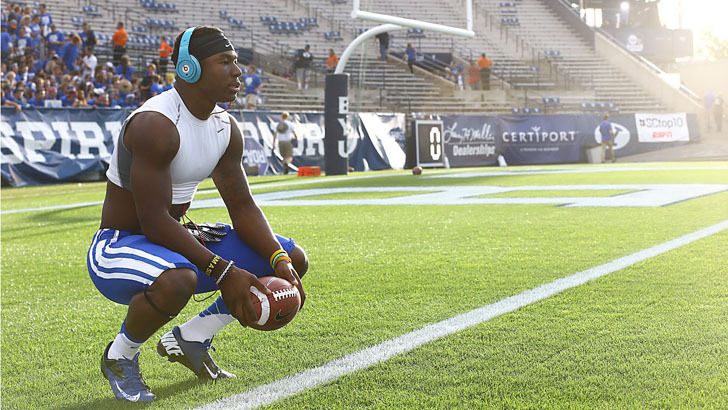 Jamaal Williams has a very bright future in football, with his sights sets on the NFL. Can he make it to the NFL without another season of college football? Yes, but it will probably come as a free agent or possibly a late round draft pick. There are simply too many question marks for him. Has he fully recovered from his injuries? Can he return to and sustain the production he had as a freshman and sophomore? Does he have off-the-field issues? Is he big enough, strong enough, fast enough? Jamaal can answer some of these questions by hiring a good agent and trainer and then showing his stuff in individual workouts. He can answer all the questions by returning to BYU. 2. His family. When news of Jamaal’s departure hit the news many of you probably did as I did and went straight to JSwag’s twitter. Upon seeing that the account had been deleted I next turned to ByuMomma (@uclagrad90)–his mother’s account. Jamaal’s mom is one of BYU’s biggest supporters and recruiting tools. She has been on-board since the beginning and has done a lot of good for BYU. As a single mother working several jobs she believes in the value of a quality education, and has stated many times that she believes a college degree is very important to her and her son. While the BYU community loves ByuMomma to pieces, Jamaal loves and respects her even more. He will listen to her. 3. His coaches (and teammates). As a two-star prospect coming out of Summit High School, Jamaal was an under-recruited diamond in the rough. He had opportunities to be a play maker as a freshman, which prior to Bronco was unheard of at BYU. But Bronco did play him and he flourished. Not only that but Bronco has always had a special place for Jamaal, acting like an overly protective father at times. When he’s gotten into trouble Bronco has helped him get back up. When he’s had things go wrong on the field (i.e. injuries) Bronco has been one of his most ardent supporters. Bronco has acted in similar fashion for other star players who have had to overcome challenges (see KVN, Hadley, etc.). Jamaal doesn’t necessarily owe BYU and the football coaches anything–but they have certainly given him opportunities to be successful and I don’t think he’ll ignore that. He’s also made several good friends in Provo who will encourage and support him in a return to BYU. 4. His fans. “J-Swag Daddy” has been a fan favorite since day one. His huge infectious smile, his youth, his charisma, and his play making ability have always made him stand out. He is quite possibly the most recognizable face on campus right now. I’m guessing he likes feeling loved and supported by the BYU community, even if he isn’t a typical white Mormon student-athlete. He will be welcomed back with open arms. 5. His legacy. He may not care about this much right now, but he certainly has the opportunity to leave BYU as one of the greatest of all-time. Just under 1000 yards rushing is all that stands between him and the BYU career rushing record. BYU plays some pretty amazing teams in 2016 and a great season could really solidify Jamaal’s place in the BYU record books, as well as giving him the positive publicity and exposure to become a high round draft pick. Others close to him (i.e. mom, teammates) will be quick to remind him of this. At the end of the day the decision to return is Jamaal’s, but I think there are some pretty compelling reasons to see him return in 2016. 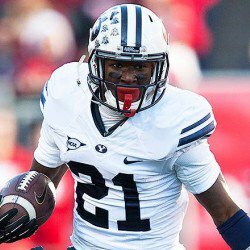 Whatever he chooses, he has a very bright future as a player and as a person, and I join with Cougarfans all over the globe in wishing him the very best, no matter what he decides to do.